The summer is here, and I’ll have at least a month of free time, getting some things of the ground. To get my juices flowing I decided to finish some old projects that’s been sitting lonely for a long time, and by that be able to soon send a bunch of files to my archive drive instead of having tons of unfinished stuff in my project folder. 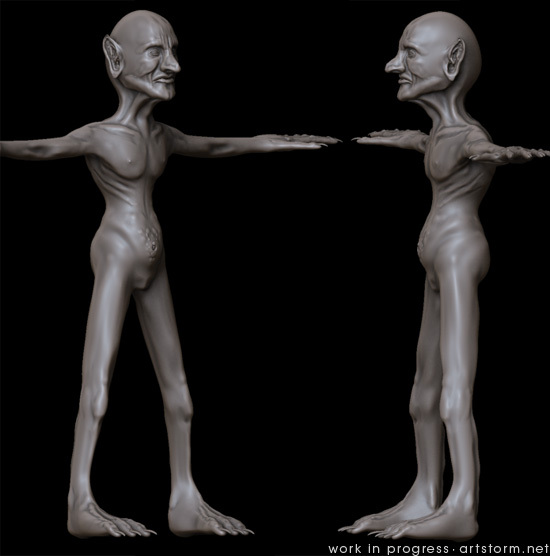 I dug up my old Goblin project, and had a session in ZBrush with him tonight. I kinda liked where he was going now, so I’m gonna continue detailing him for a few hours and add some accesories to him and then see how it all turns out. If I am happy I gonna shade, texture and render him, otherwise he’ll hit the graveyard.